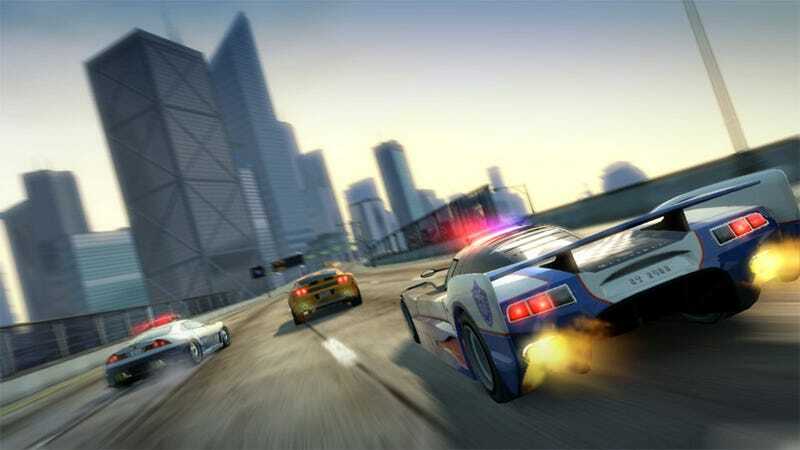 Criterion Games continues to change the face of Burnout Paradise with the release of the Cops and Robbers downloadable content add-on for the Xbox 360 and PlayStation 3. Hearkening back to Burnout titles of old, the Cops and Robbers add-on pits two teams of players against each other, both vying for control of a load of stolen gold bars. The goal is to obtain the bars and return them to your team's base by any means necessary, which in Burnout generally means lots and lots of crashing. To help make the crashing more interesting, Criterion also provides 35 new police vehicles; re-skinned and slightly remodeled versions of 33 of the game's already existing rides. Is the Cops and Robbers pack worth your $10 or 800 Microsoft points, or is Criterion getting away with highway robbery? The Paradise City Gold Rush: Cops and Robbers pits two teams against each other as they vie for control of a large pile of gold bricks. The goal is to get the booty to your team's headquarters and score a point while the opposing team attempts to take you out and grab the loot for themselves. The whole affair plays out like a sporting event, complete with the requisite trash-talk. With the gold carrier slowed by the weight of precious metals, teamwork is essential to winning the day. All in all, an excellent addition to Burnout Paradise's online game modes. The International House Of Cop Cars: Cops and Robbers introduces more than 30 police vehicles to Burnout Paradise's constantly growing stable of vehicles. While each new car is a modified version of an existing vehicle, the modifications are much more than simple re-skinning. Each car gets a unique police car makeover, with custom graphics and light placement that makes sense based on each model. Criterion went as far as to give the cars different sirens based on their real-life inspiration's country of origin. With fans readily paying $8 for the four vehicles in the Legendary Cars pack, $10 for 33 modified vehicles seems like a no-brainer. A Distinct Lack Of Variety: The entertainment value of the Cops and Robbers game mode starts to fade quickly after your first few rounds, once you realize that there just aren't enough variables to the formula. The gold spawns in the same handful of spaces, and the bases for the two teams are always the same. Sure, Burnout Paradise has plenty of ways to get to the same place, but in the end you're still getting to the same place. It's one of the limitations of a game play mode that calls out for more maps being added to a game that only really has one. Of course you aren't meant to spend your time online in Burnout Paradise only playing the Cops and Robbers mode, so the lack of variety isn't as much of a problem as it could be. I liken online in Burnout Paradise to a group of kids playing on the playground, and Cops and Robbers is just another game those kids can play when they aren't just running around aimlessly, bumping into things and falling over. With a new way to play and 33 new police cars to play with, Burnout Paradise's Cops and Robbers pack is the right amount of new content for the right price. I'd say it was a steal, but even I have more self-respect than that. Burnout Paradise Cops and Robbers was developed by Criterion Games. Released on April 30th for the PlayStation 3 and Xbox 360. Retails for $9.99 or 800 Microsoft points. Played multiple rounds across multiple online sessions.